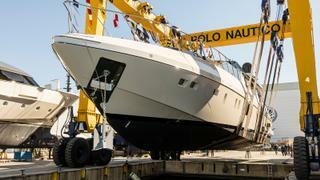 Mangusta has launched the fourth hull in its Maxi Open 110 series. Built for a European owner, the 33.8 metre two-decked yacht was launched on February 25 and sold in December 2017. The “sleek and sporty” exterior design comes from Stefano Righini while the interior design brief was handed to the Netherlands-based designer Piet Boon. “This is a yacht that clearly expresses the comfort and luxury the owner had in mind for guests; taking them from one place to another in a few hours, the Mangusta 110 allows them to discover new landscapes every day and to enjoy a large number of areas for socialisation,” Mangusta said. Accommodation is for a total of eight guests in four cabins comprising a master, VIP, double and twin while the crew quarters allows for a staff of three. Powered by twin MTU 16V 2000 M96L diesel engines linked to KaMeWa waterjets, the yacht have a top speed of 33 knots and range of 380 nautical miles at 31 knots. The Mangusta 110 also features zero-speed gyroscopic stabilisers for comfort at anchor and underway.